Greenville has blown up in the last few years in every way (jobs, real estate, cultural scene), and yet it remains one of the best deals anywhere in terms of affordability. It’s right in the foothills of the Blue Ridge, with amazing rivers and wilderness areas within close reach, not to mention the awesome class V drop (Reedy Falls) running right through the center of town. Downtown Greenville is a great study in historic preservation and usage: The old mills now transformed into complexes of residential space with great restaurants, cafes, and green spaces all around it. Downtown Greenville is Upstate South Carolina’s largest central business district. 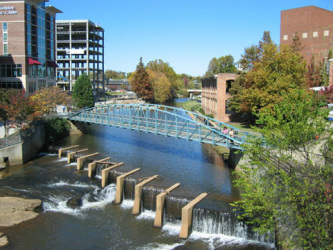 With wide sidewalks, outdoor plazas, and streetside outdoor dining opportunities, Downtown Greenville offers a pedestrian-friendly atmosphere that has been compared to that of a European city. Truly, shopping and dining in Greenville are pleasurable experiences. One of dowtown's biggest attractions is the Falls Park on the Reedy, featuring two sets of waterfalls. Located in the West End area and adjacent to the Peace Center and the new Governor's School, the Park also has miles of walking and bicycle trails that follow the river along our Downtown greenway. Downtown Greenville is the pre-eminent business center of the Upstate, accounting for over one-third of the total office space in the Greenville-Spartanburg metropolitan area, with over 3 million square feet. Downtown Greenville is one of the area’s most popular dining and entertainment destinations. With over 100 restaurants and pubs clustered around Main Street, Greenville's downtown offers a wide variety of options for all tastes. Visitors to downtown can enjoy a year-round series of special events, suited to the season and appealing to a diverse audience. From March through September, weekly concerts ranging from blues to jazz to beach music entertain visitors three nights a week, while larger downtown celebrations mark the coming of each new season. 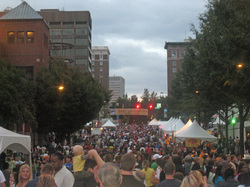 With over 300 event days each year, Greenville leads the region in hosting visitors. While the official population of the city of Greenville is less than 90,000, recent data indicates a population of approximately 500,000 in Greenville County. Greenville's moderate climate (humid subtropical) offers a full change of seasons, with generally mild, short winters, hot & humid summers, warm springs and crisp autumns. Although the average annual temperature is 60 degrees F (avg max 71F and avg minimum 50F), monthly averages range from 40.8 °F (4.9 °C) in January to 78.8 °F (26.0 °C) in July, with lows around freezing in the former month. Highs reach 90 °F (32.2 °C) on 38 days per year, and sometimes breach 100 °F (37.8 °C). The average rainfall is 49 inches and an average snowfall of less than six inches per year. Precipitation is usually well-distributed throughout the year.